Russia's President Vladimir Putin has resisted diplomatic pressure from Western nations to support tougher action against Syria's government. Mr Putin, an ally of Syria, called for more time to be given to the peace plan of envoy Kofi Annan. The US and UK have called on Moscow to strengthen its condemnation of the Syrian regime since last week's massacre in Houla, where 108 died. Earlier, Moscow opposed a UN Human Rights Council resolution on Syria. In an emergency session on Friday, the council condemned Syria over the Houla massacre and called for an investigation. But Russia voted against the US-backed resolution, arguing that it was "unbalanced". Meanwhile, a US government website published satellite images apparently showing a mass grave in the Houla area. Correspondents say Mr Putin's latest remarks, made after a meeting with French President Francois Hollande, highlight the divisions between Moscow and Paris towards the conflict in Syria. Speaking at a news conference, Mr Hollande called for further pressure and sanctions, and said the only solution was for President Bashar al-Assad to resign. He said Mr Assad's regime had conducted itself in an "unacceptable, intolerable way" and had committed acts that disqualified it from power. "There is no possible exit from this situation except with the departure of Bashar Assad," he said. 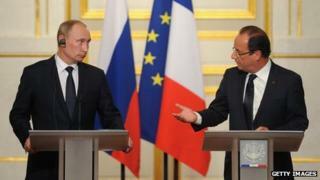 Mr Putin, however, questioned calls for the Syrian president to quit. "Why are we thinking that if we push the current leadership from power, then tomorrow general wellbeing will begin there," Mr Putin said. "What is happening in Libya? What is happening in Iraq? Has it become safer there? We propose to act in an accurate, balanced manner at least in Syria." He said the most important thing was to prevent the worst-case scenario of civil war. There have been calls for more action to be taken in Syria to stop the violence, which has continued despite Mr Annan's six-point peace plan. Speaking in Oslo on Friday, US Secretary of State Hillary Clinton hit out at Russia saying she did not believe it was acting impartially. "We know there has been a very consistent arms trade, even during the past year, coming from Russia to Syria. We also believe the continuous supply of arms from Russia has strengthened the Assad regime," she told a news conference. On Thursday, Western officials confirmed a report that a Russian cargo ship had delivered heavy weapons to the Syrian port of Tartus last weekend. Mr Putin has insisted that Russia was not supplying Syria with arms "that could be used in a civilian conflict". Earlier, the UN Human Rights Council said it wanted investigators to identify the perpetrators of the killings in Houla. Media captionNavi Pillay's representative: "Those who order, help or fail to stop attacks on civilians are individually criminally liable for their actions"
In the vote, 41 members voted in favour of the US-backed resolution condemning Syria, while Russia, China and Cuba voted against it. Two other countries abstained and one was absent. Residents of the village of Taldou, in Houla, said militiamen had been sent in early last Saturday after the Syrian army unleashed a barrage of heavy weapons late on Friday in response to a local anti-government protest. The UN high commissioner for human rights, Navi Pillay, said the killings in Houla may amount to crimes against humanity. She said those who ordered attacks were "individually criminally liable", and urged the UN Security Council to refer Syria to the International Criminal Court (ICC), a move opposed by Russia and China. As Syria is not a state party to the ICC the court has no jurisdiction to indict its citizens without a Security Council referral. Meanwhile, opposition activists said there had been another mass killing of civilians by pro-government militiamen. Thirteen factory workers were forced off a bus and executed on Thursday in al-Buwaida al-Sharqiya, near the western town of Qusair, they said. Several videos posted online showed bodies with severe wounds to the head and stomach, consistent with being shot at close range.